Live Nation presented Chris Cornell live at The Royal Theatre Thursday July 21, 2016. Magmazing Music was there and took photos. 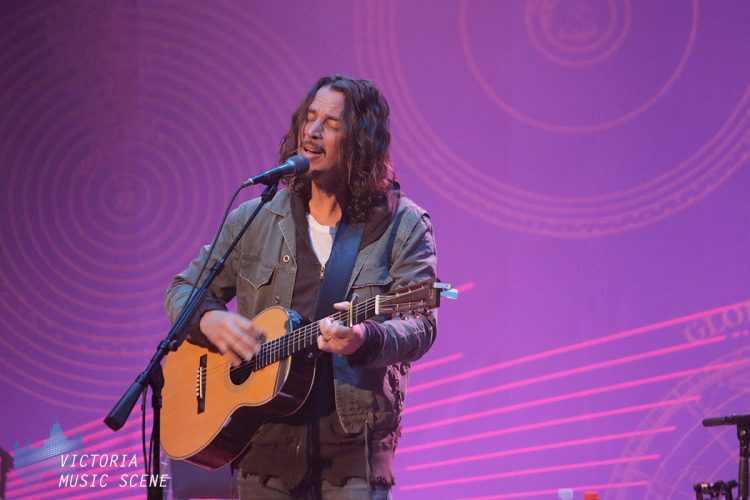 Chris Cornell brought his Higher Truth acoustic tour to a sold out Royal Theatre in Victoria Thursday and right off the bat was greeted by a standing ovation from the crowd. It was the first of many the crowd gave Cornell throughout the evening. Considering how many shows he has performed on this tour and the and how long each show goes for it’s amazing how good his voice was. He performed 29 songs and played for a little over two and a half hours. The setlist was filled with a range of solo work, Soundgarden, Audioslave, Temple of the Dog and a few select covers. Bryan Gibson accompanied Cornell on much of the set on cello or keyboard while other times Cornell performed solo with various guitars, a harmonica, loop machine, and even a record player. This show had a strict no photos or video policy and early on security could be seen walking up and down the aisles looking for lit LCD screens and informing audience members to shut their phones and point and shoot cameras off. After the first couple songs people seemed to mostly get the message other than a few sneaking a quick snap on their phone here and there. Some highlights from the show included Cornell bringing Tony Harrington on stage. Three years ago, when Chris Cornell rode onto the Farquhar Auditorium stage on a custom bike built by Harrington and the Angels Chopper Bicycle Club. Cornell followed that up with a Johnny Cash style arrangement of Soundgarden’s ‘Rusty Cage’. ‘Hunger Strike’ brought about one of the bigger standing ovations of the evening. The main part of the set ended with an amazing mashup of the melody of U2’s ‘One’ with the lyrics of Metallica’s ‘One’. Fantastic Negrito was the opening act for the concert.